In this blog, I would like to discuss, two patients with Tuberculosis, both males, aged 45 years, but the outcomes were vastly different in them. bad shape - Temp 99 F, HR 120/min, BP 90/60 mm Hg, Respiration 22/min. Looking cachectic and dull. Well, it looked like septicemia and incipient peripheral circulatory failure. Hb 5 gm%, TC: 7600/cumm, P 78% with toxic granulations, ESR 122 mm, RBS 69mg% all pointed to the above. What could we do here. Started an IV, pumped him with Ciprofloxacin and Flagyl and told the relatives to take him to Bangalore - St Johns Medical College. A taxi driver friend of theirs helped and he reached Bangalore 4 hours later. Two pints of blood and then he was operated the same night. It is now a week, post operatively and he is doing well. Dr Santosh of SJMCH has been of immense support and help. Now the other one. 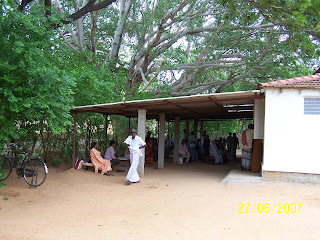 Venkataramana came to the health centre on 11 June with a classical history of cough, sputum, fever and weight loss. He had already spent upwarsd of Rs 10000, going from one RMP to the other, but never once accessing the Primary Health Centre or a Physician. Many injections and IV fluids later, his weight was down to 32 kg (from I guess a healthy 55 kg) and he could barely walk to the outpatient. 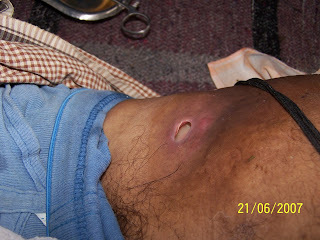 Clinically his lungs were full of crepitations and Sputum was 3 + for TB Bacilli, HIV was negative. OK so now we were sure and promptly started him on aggressive Anti Tubercular Treatment. 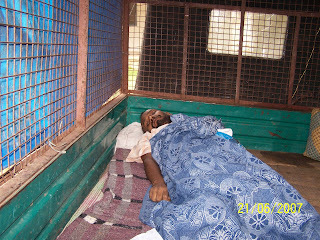 His house was close to the PrimaryHealth Centre (5 minutes walk) and he enrolled with them for continuation of treatment. Today his wife came and met me. Venkataramana had passed away, 10 days ago. Within a week of starting ATT, he developed high fever and progressive breathlessness. By the time they decided to take him to a hospital it was too late - he was gone leaving behind three children ages 15 years to 9 years. The village has rallied around, but what will become of the children, with their father having gone leaving behind a mountain of debt. Two men of the same age - luck favoured one and deserted the other - I suppose that's the way life is. It is never easy to face the death, least of all, when it is theyoung and the poor who have suffered. Thanks for bearing with me in my sadness and angst. I would be failing in my duty if I did not thank all of you, who have contributed to supporting our activities. The number of the rural poor who have benefitted from your generosity, both directly as well as indirectly are enormous. Mr Murali Reddy - a Chemist and a son of the soil of Rayalseema who has encouraged us both financially and more importantly keeping my spirits up through his regular email correspondence. Sishukunj International of the UK - for supporting child care in tertiary hospitals - may god bless all of you. Mr Jagdish Dore - an old student, many years my senior who has helped us immensely, year after year with the Tuberculosis Programme, and in the process saved many a family from the brink of debt trap and extinction. Mr Ashok Singhal - my classmate from school and a friend for the running of the health centre. Ms Chatura Padaki - an old student of Rishi Valley, who with her regular contributions keeps us going. Mr PV Rao - A philanthrophist who lives very humbly in a village nearby and whose contributions to improving the lot of the rural poor has benefited all of us. and many many others who have chipped in through the year past. Both Vidya and I hope and pray that many more will contribute and help us in our endeavour to reach out to the sick and suffering rural poor. Its been a while since I have blogged - heh! heh! vacation and all that. After getting back, there was the usual flurry of work, in getting the HealthCentre ready for another year. There have been changes both in terms of infrastructure as well as staffing - No I or my wife have not runa away! First of all - in the adjoining photograph you can see the extended roof. We cannibalised old GI and Asbestos Sheets to cover our frontage. Now patients waiting have a shade over their heads and the roof came in just at the right time. 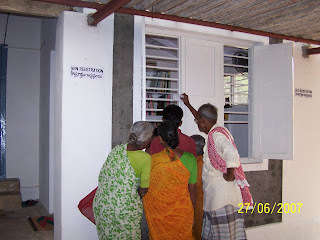 We completed the work in the first week of June and promptly thereafter it rained - Boy did the patients bless us for providing them with shelter. Secondly we got two additional rooms - a Registration room and a room for us to consult in with a modicum of privacy. Oops - sorry no photograph of our consulting room. There are separate sections for the pharmacy, accounts and we have even managed to add a single bed as a DAY CARE/EMERGENCY ROOM. All this has made the patient flow much easier and there seems to be no rush or hordes of patients peering over ones shoulders to see when their turn comes. Promise you more photographs as time goes by.